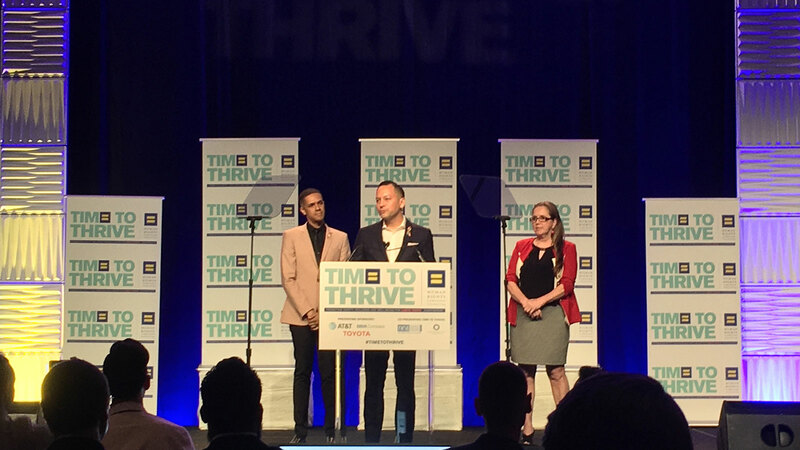 HRC Foundation’s fifth annual Time to THRIVE Conference for youth-serving professionals got underway today in Orlando, and the opening event included a spoken and video tribute to the memory the 49 people -- most of them LGBTQ and Latinx -- killed in the senseless act of gun violence at Pulse nightclub on June 12, 2016. Speakers also honored the 17 innocent people who died this week in the horrific gun violence at Marjory Stoneman Douglas High School in Parkland, Florida. “This week, Floridians are reeling from yet another tragedy in our state. The news coming out of Parkland is all too familiar. Two years ago, we were feeling the same grief. Last year, HRC unveiled a monumental art installation at its Washington, D.C., headquarters to mark Pride Month and honor the victims on the one-year mark of the deadly attack in Orlando. Our hearts remain with the survivors, families and friends of the 49 people whose lives were taken that day. In the wake of the recent high school massacre in Parkland, Florida, HRC renewed its call for common-sense gun safety measures and policies to address the epidemic of senseless violence across the country. Time to THRIVE is an opportunity to raise the voices of the community against hate and highlight the importance of safe and inclusive environments for all LGBTQ people and youth in the U.S. and around the globe.